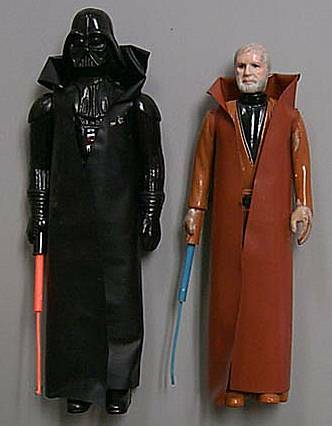 These first shots of Darth Vader and Ben Kenobi are two of the earliest action figure prototypes to have entered the hobby. Being, in essence, early product samples, these prototypes are identical to their production counterparts in most respects. Of major interest here, of course, is the inclusion on these figures of the original lightsaber design, a feature which is characterized by the extendability of the thin portion of the saber's extreme end. The sharp observer will notice here an interesting feature in the case of the Vader figure. Specifically, the saber has a mushroom-like tip at its end, a feature which does not appear on the few DT Vaders to have actually been released. In fact, this version of the saber was previously known only through early promotional photography and packaging art, some examples of which can be seen here. The knob probably prevented the thin extension from sliding too far back into the larger saber piece, as well as allowed for it to be more easily grabbed and pulled out. For whatever reason, the feature was altered prior to production and all DT figures released had the non-tipped versions installed in their arms. While its definitely the sabers that stand out on these pieces, they are also interesting in several other respects. Most significantly, the capes are made from a slightly thinner vinyl than that used on the production figures, and are also cut in a different style. Also, though you can't tell it from these photos, both figures lack the date and copyright stamps on the backs of their legs, a feature which pretty much defines them as first shots. Make no mistake--these are some of the most significant first shots ever to surface. They caused quite a stir when they first appeared in Toy Shop.